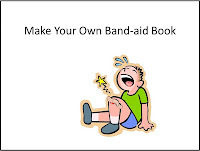 In the late 1980s, I made a band-aid book by tracing some body part picture cards, glued the pictures to card stock, laminated the pages and added real band-aids. 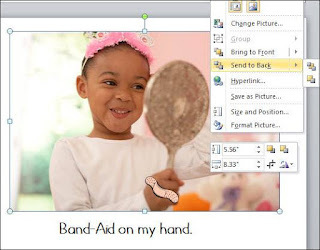 Now, no markers and glue are needed - make your book in PowerPoint and use your own digital pictures or find pictures in the Microsoft collection. I began this PowerPoint book using photographs of people and a band-aid clip-art picture with a transparent background - all from Microsoft. I didn't finish the book as you might want to add pictures of your students. They love to see themselves and I am sure that they will like the added band-aid on their picture. Use this book when labeling body parts, answering questions, and increasing utterance length. Change the phrases in the book to work on he and she or his and her. 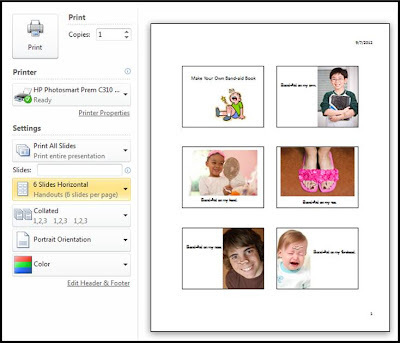 If you add student's pictures you can also work on possessive -s.
Give your book a title. Add additional pictures from Microsoft or add your own photos. The band-aid has a transparent background and can be used on any picture; just make sure that you move your picture to the back. Print the books, view them as PowerPoints or import them to use on your Promethean or Smartboards. Print them as handouts to make mini-books or small visuals. AND, save your PowerPoint as a pdf to add it to your iBooks collection. Thanks for sharing such a wonderful idea!